Here at We’ve Got Talent we have a cornucopia of extras, actors and background artists available for movies and other filming requirements you may have. Our talent are based all around the UK, so where ever your filming is taking place, be reassured that we will be able to help. Please see below some examples of where we have provided talent for our clients filming needs. 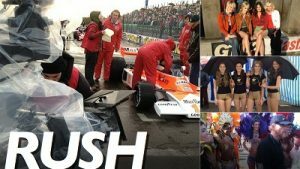 We were delighted and proud to supply supporting artists for a crowd scene for the fantastic Rush movie. We provided more than 200 extras to be in the crowd during the filming for the racing scenes at the circuits. Our brief was to think 70’s and have a diverse range of people that would fit the look and have the feel for motor racing at that time. The casting team were delighted with our team. We supplied 100 extras for the 2015 Boohoo.com Christmas advert. The background artistes were required to attend the shoot that consisted of both video and still shots for their Christmas commercial. We were required to provide a crowd that portrayed a “typical night club scene”. This was the 3rd year running that the client had used our talent. More recently we have provided actors for the filming of a promotional advert for a new app! We were given the task of casting four of the main characters – some with speaking roles. This was quite a last minute arrangement with firm casting guidelines, the client was happy with our talent, so much so they added extra days to their original schedule. We have also worked with a major crisp brand for their commercial, we had actors portraying police officers, solicitors and we also provided performers to wear giant crisp packet costumes!! Just a little bit about ourselves, we work very differently to many other casting agencies, the rates that we quote to you are on a buyout basis. The prices are not subject to other costs. This is an advantage for clients and it enables us at We’ve Got Talent to provide you with the talent you require at agreeable costs. Please do get in touch with us at We’ve Got Talent to see how we can help you with your filming requirements.